This is the audio that I am posting by suggestion of Eponymous. The sole thought that these were the last words of a man who would die soon after this audio message reminds me that there are still people willing to sacrifice to set an example. He is not someone begging for his life, he is a corageous man with a calm tone of voice in the middle of a fascist coup. The best thing I can do is to contribute to his wish to be heard in the future by people who have truly decided to fight against the ones who believe in an unequal society. As per a previous suggestion made by Whynot, the best thing to do is to right click with the mouse and download the audio so that you can play it afterwards. In order to better understand what goes on in the mentioned region we have to know some parts of the recent history. I decided to go back to the sixties, because there is still a direct link between the events that happened at that time with the events that we witness nowadays. During the sixties, inspired by the Cuban revolution and by a good number of left wing thinkers, many movements that tried to solve “the problems of society” emerged. One of these unresolved issues was the property of the land. Since the times of the Spanish Conquistadores, the land had been property of people of Spanish/European descent. This situation created a lot of stress between the Indian/Mestizo people and the ruling elites, specially in countries with large Indian populations like Peru, Bolivia and Ecuador. After witnessing the victory of Fidel Castro in New Year’s Eve of 1959, some of these movements opted for the violent revolution. The Colombian FARC had its origin in the fight for land reform of those times. These movements failed to achieve their goals. Che Guevara was killed in Bolivia, the movements faded away in 1965 in Peru. The FARC continues until now, but I do not know if with its original goals. After that, different countries had different evolutions. In Bolivia and Ecuador, land reform never happened. In Peru, the left wing military government of Velasco declared the land reform in 1969. 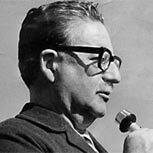 In 1970 Salvador Allende was elected president in Chile. Socialist ideas were thriving. The USA thought that it would lose the region to the Soviet sphere of influence. In most countries, pressure from the US was felt. In 1973, Allende’s government fell and Pinochet seized power. In 1975, Velasco’s government in Peru fell, leading to a pro US government by Morales-Bermudez, in 1976 Videla obtained power in Argentina, initiating a fierce hunt of socialist and communists, not only in Argentina, but in Brazil, Uruguay, Chile, Bolivia, Peru and Paraguay. The military governments of all those countries formed an association called AAA (Alianza Anticomunista Americana), with approval of the CIA. The executed a plan called “Condor” to wipe out the left wing ideology from South America. At the same time, countries like Colombia (in spite of the FARC) and Venezuela remained more stable and were enjoying better economic times associated with the high oil prices in the international market. Human right concerns and the external debt crisis put pressure on the military governments and a democratic (and progressive) wave disseminated through the region. In 1982 Siles in the Bolivia, in 1983 Alfonsin in Argentina, in 1985 Garcia in Peru, in 1990 Aylwin in Chile obtained power by democratic means. However, this wave of progressiveness did not last long since the economic models failed and led the countries into hyperinflation. A new wave of right wing governments, with more democratic manners emerged in Peru, Argentina, Bolivia, Ecuador, Uruguay, Paraguay. Chile followed a stable pathway, Venezuela experienced the economic crisis for the first time and led to Chavez attempted coup in 1992. In Peru, Fujimori instituted an autocratic regime in 1992. With the new millennium, the pendulum started to swing to the left again. Venezuela elected Chavez in 1999, Argentina elected Kirchner in 2002, Chile elected Lagos also in 2002, Brazil elected Lula in 2003, Ecuador elected Gutierrez in 2003 and Uruguay elected Vasquez in 2005. They are all left wing politicians. The case of Peru and Colombia is interesting. The Shining Path and the FARC, respectively, have created certain fear in the population towards the left wing movements. The relationships with Cuba have changed based on the left or right wing orientation of the governments. 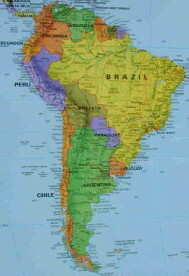 The actions of the US in South America have been felt ever since the cold war. The US is obviously interested in having control of the whole continent and uses their influences in order to achieve that goal. For this topic, I recommend strongly a CNN special called “The Cold War” available in VHS. One of its chapters is called “Backyard” and it refers specifically about the actions of the US in Latin America. A Fascist America...How close are we? Please take a look and read the article, I believe it is very interesting. By the way, it is not written by a left wing guy. For the right wingers, please read the whole article before posting comments, I have noticed that sometimes you do not do it that way.